Sarkoff (T.P. McKenna) was formally the president of Lindor, but following a crushing election defeat he now lives a comfortable, if restrictive, existence on an unnamed planet as an effective prisoner of the Federation. 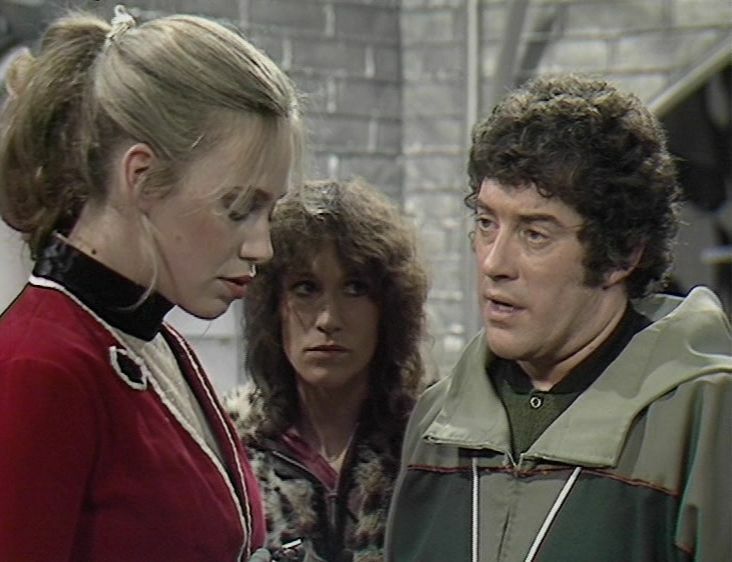 Blake and Cally attempt to persuade him that he needs to return to Lindor as he’s the only man who can unite his people and resist the Federation’s plans to invade. But Sarkoff appears to be a broken man, haunted by his past defeats. Eventually Blake does convince him, but when they teleport back to the Liberator they find it eerily deserted. The ship has been captured by a number of Amagon bounty hunters, led by Tarvin (Mark Zuber), who plans to sell the crew and the ship to the Federation …..
Bounty is the first example of a Blakes 7 episode that opens “cold” – we see Cally in a forest, hiding from Federation troops, and shortly after she’s joined by Blake. We don’t know where they are or what they’re doing – which gives us a strong hook into the story. Previously, we’ve opened with at least several minutes exposition on the bridge of the Liberator (as in Project Avalon) before they teleport down. The absence of this helps to move the story along a little quicker. To be honest, this is very much an episode of two halves – the first concerns Blake’s attempts to persuade Sarkoff that he needs to return to Lindor and the second takes place on the Liberator as Blake and the others attempt to overpower the Amagons. The first is by far the stronger, helped no end by T.P. McKenna. McKenna was an incredibly prolific actor, with a list of credits far too numerous to mention (although his appearances as Richmond in the final series of Callan are especially good). He’s perfect as the ex-politician who lives in comparative luxury (surrounded by various treasures from 20th Century Earth) but appears to have an inability to grasp the reality of his situation. It’s obvious to Blake that Sarkoff is a prisoner of the Federation and that they’ll return him to his planet only after they’ve taken it over – so he can rule as a puppet President. Sarkoff, on the other hand, tells Blake he’s merely their guest and the guards are there to prevent his assassination. But Tyce (Carinthia West) is convinced that Sarkoff knows the truth of the situation, even if he won’t admit it. Sarkoff is a spent force and even though he redeems himself at the end of the episode, the question has to be, will he ever be anything more than a figurehead? He could very well unite his people in the short-term, but beyond that there’s the uncomfortable possibility he’ll find himself manipulated by others for their own ends. It’s interesting that Blake latches onto Sarkoff as a unifying figure. 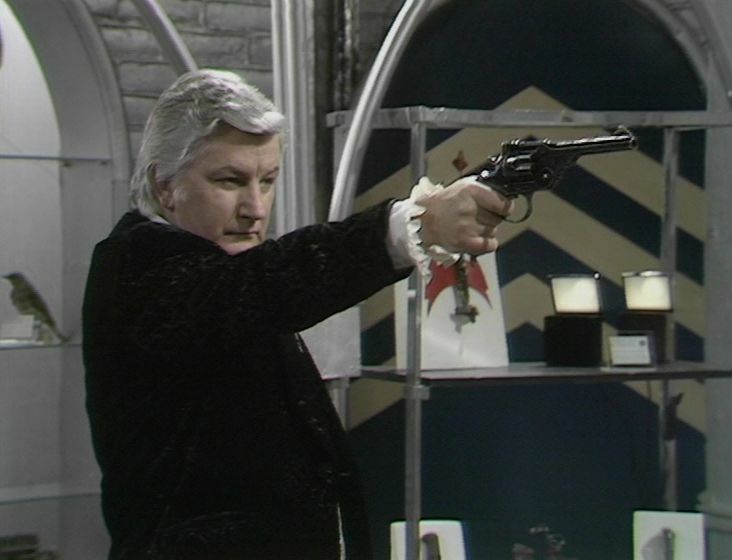 Later in Blakes 7 (especially in the final episode, Blake) Roj Blake himself becomes a figurehead capable of inspiring trust and loyalty in others – which is the reason why Avon attempts to find him again. Whilst I like Bounty (mainly for McKenna’s performance) it’s fairly sloppily scripted. Firstly, Sarkoff is guarded by very inept Federation troops. Although they know that at least two intruders are at large, they don’t exactly leap into action (and one of them also misses the fairly obvious sight of Cally climbing a wall and pulling a rope up behind her!). It’s also baffling that none of them decide it might be a good idea to check on Sarkoff – thus allowing Blake plenty of time to win him round. Added to this, the actor (Mark York) playing the guard commander is, shall we say, not terribly impressive. Whilst Blake and Cally are down on the surface, the others discover a ship which seems to be in distress. You’d have thought that by now (especially after the events of Time Squad) they’d be rather cautious – but instead they just blunder straight into the trap. Gan teleports over and a few minutes later we hear him report back that everything’s fine. It’s clear that something’s not right – he’s talking in a slightly strange, emotionless way – but nobody twigs. And by the time they do, it’s too late and the Amagons (all three or four of them) have taken over the ship. It’s difficult to take them seriously, mainly because of their exotic clothing. Mark Zuber does do his best though and Tarvin’s past relationship with Jenna is an intriguing touch – as it allows her a reason to apparently change sides. Had this been earlier in the series, her shifting allegiance might have been more believable, but it’s not really a surprise that she hasn’t really betrayed her friends. An interesting part of Bounty is that it shows us that Blake does have some purpose. So far in his fight against the Federation, he’s actually done very little – destroying the transceiver complex on Saurian Major (which seemed to have little effect) and stealing the Federation’s cypher machine (which was detected almost immediately) have been his main achievements. But although they weren’t able to get a great deal of useful material from the cypher machine before the Federation changed the code, at least they managed to learn about the Federation’s plans for Lindor, which initiated Blake’s visit. In the general scheme of things, helping to keep one planet out of the Federation’s clutches is still pretty small beer, but it’s a step in the right direction. Apart from McKenna, another noteworthy appearance comes from Carinthia West as Tyce. Late on, it’s revealed that Sarkoff is her father – prior to this, the exact nature of their relationship (older man, younger woman) was open to other interpretations. Tyce operates as her father’s conscience and there’s good reason to suppose that she’ll be as important, if not more so, than Sarkoff himself when the new government on Lindor is established. One odd moment occurs after Blake, Cally, Sarkoff and Tyce teleport back to the ship. Blake and Cally are captured and locked up with Avon, Gan and Vila, whilst Sarkoff and Tyce are allowed to remain on the flight-deck with Tarvin. What’s strange is that despite all the commotion, Tyce is able to change her top and hairstyle! Thanks to T.P. McKenna (and some nice banter between the regulars) Bounty is a decent watch.